Home animals entertainment Interesting news recent slider Viral Section Karachi Culls Nearly 1,000 Stray Dogs To Prevent A Possible Rabies Outbreak. Seriously? Karachi Culls Nearly 1,000 Stray Dogs To Prevent A Possible Rabies Outbreak. Seriously? 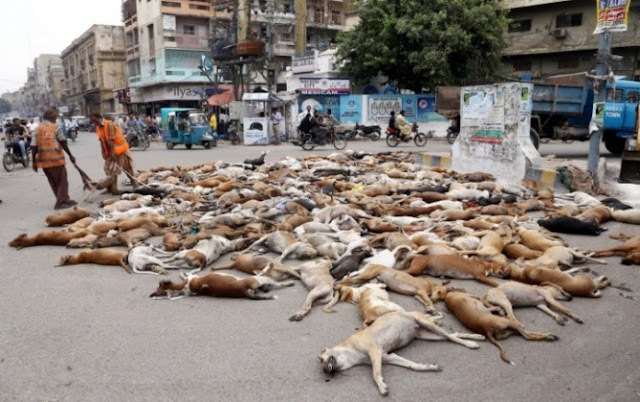 In a case of extreme animal cruelty, the Saddar Town Administration of Karachi, displayed the dead bodies of 1,000 stray dogs that had been poisoned by the Pakistani government. Waqar Ahmad, chief sanitary inspector of DMC south, Saddar town, was present on location to supervise the public display on a busy road. It is believed that this extreme step was taken in response to the rising number of stray dog bites reported in Karachi. The stray dogs were fed chicken pieces laced with poison and their bodies were gathered in a truck from various parts of the city after they died. 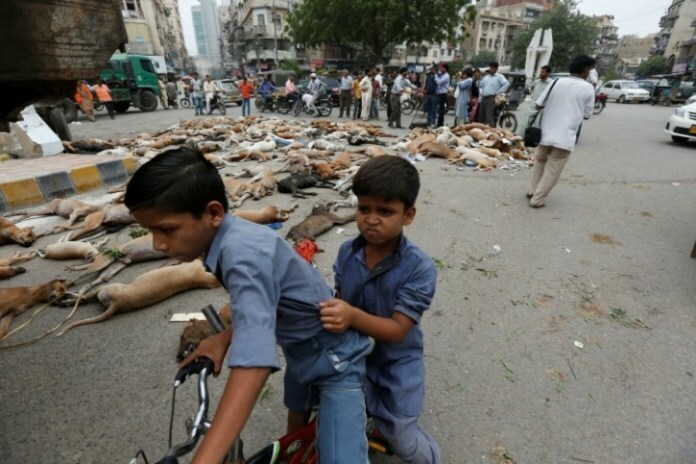 According to a report in the Reuters, “At least 700 dogs have been killed only in two areas of Karachi’s south in the last couple of days,” Sattar Javed, a spokesman for the municipal authority has said. This operation has been conducted in six city districts and officials have estimated that thousands of stray dogs have been killed. However, an official count was not declared. 6,500 cases of stray dog bites were reported in Karachi alone last year. This year there are already 3,700 cases. Animal activists in Pakistan have taken to social media to ask why sterilization is not being considered as a more humane solution to the problem. “It’s cruel and inhumane to kill dogs – mass vaccination and sterilization is humane, protects communities and it saves money. We urge the civic authorities in Pakistan to adopt this humane solution to stray dog population management and rabies control,”a reports from the Pakistan Animal Welfare Society (PAWS) has said. If you wish to request the Pakistani government to consider more humane solutions to the issue as well, please go through the petition and sign.